Elements of Solid State Physics Second Edition M. N. Rudden and J. Wilson University of Northumbria at Newcastle, Newcastle upon Tyne, UK This textbook provides a basic introduction to the principles of solid state physics and semiconductor devices and will prove essential for first and second year students of physics, materials science and electrical/electronic engineering courses. It assumes no prior knowledge of quantum or statistical mechanics and relies on simple models to illustrate the physical principles. However, the opportunity has been taken in this edition to extend the concept of energy bands to a consideration of E--k curves, and certain new material has been added, notably relating to superconductivity and optoelectronic devices, including lasers, following significant developments in these areas. Elements of Solid State Physics, Second Edition, presents the student with an essentially non-mathematical approach to the subject. Arranged in a logical sequence with many clear illustrations, each chapter has a number of worked examples and discussion points, as well as questions and answers. Readers of this fully revised and updated edition will receive a thorough grounding in the principles of solid state physics and should have sufficient knowledge about modern electronic devices to proceed to more advanced texts in this area. Main Contents: Some Aspects of Modern Physics; Structure of Crystalline Solids; Theories of Conduction and Magnetism; Energy Bands in Solids; Quantum Theory of Conduction; Semiconductor Devices. 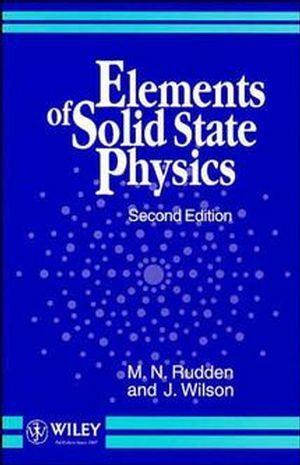 Michael N. Rudden and John Wilson are the authors of Elements of Solid State Physics, 2nd Edition, published by Wiley. Some Aspects of Modern Physics. Theories of Conduction and Magnetism.